Desperate Newspapers? Shades of Dickens! The Trib, aka the Chicago Tribune, is running a serialized story by Chicagoland-based author Audrey Niffenegger. She of, “The Time-Traveller’s Wife.” This one is called ‘Secret Life, With Cats.’ It’s a ghost story, and it’ll be seven chapters, concluding on — Halloween. Ms. Niffenegger also did the fine illustrations. She told me once that Aubrey Beardsley was an inspiration for her, and I see that in the black and white cats. 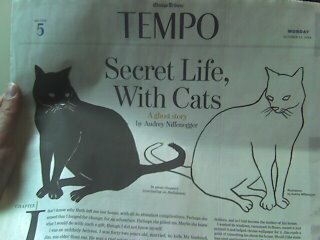 At least the Trib is trying literature and illustration. Their gambit reminds me that Charles Dickens serialized novels in the Morning and Evening chronicles. He eventually invested some of his royalties into a radical newspaper. I wonder if Niffenegger will? And to learn more about Audrey Niffenegger, click here and then scroll down for her interview with me, on Hello Beautiful! You are currently browsing the archives for the Niffenegger category.